I'm thinking about switching gears. I originally purchased the plans for the Tubby Tug, because I thought it was cute, and looked simple enough. Plans were to make it trolling motor powered, as some have done in the past. But recently, I've been thinking that it's probably a little too small for me, my wife and son all to go out at once. But electric power has always been the goal. So, I have been looking at other designs. I like the Power Yak, but it looks to seat only two, and I am loath to modify anything too dramatically at this point, or overload it. The Lo Voltage is just too large for consideration. That brings me to the Amp Eater. Perfect size, but the propulsion system (specifically the purchased parts) make this more expensive than I want. Conventional prop shaft, stuffing boxes, etc. put it out of the reach of my meager budget. Fabrication I can do, but casting large parts like that is beyond my expertise. Which brings us to the question: has anyone successfully powered an Amp Eater using a modified trolling motor? I'm not looking for blazing speed (obviously), but just a nice, quiet cruiser in protected waters (Finger Lakes). Doubling up on the batteries for extended range/cruise times is not an issue, but will I be so underpowered as to having to resort to paddling? I need to get started soon, as boating season is quickly approaching, and I have to order plans. Any insight into this is appreciated. Nobody have any opinions or advice? How about doing the rudder and motor together like this using a trolling motor. Then have a nice wood tiller handle to the cockpit and wire the rheostat for throttle to the cockpit or onto the wood tiller handle. A couple people on the forum have experience doing this. A trolling motor won't be underpowered. However, you will be limited to 4-5 mph no matter how powerful of a trolling motor you buy. It's just the way they are designed. Now in your case, I would strongly recommend a model with digital speed control. They are much more power efficient than the older tech of the 5-speed models. With the added advantage of "infinite" speed control. 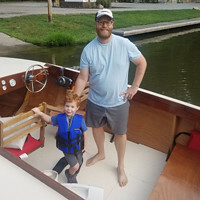 For a 13' wooden boat 55lbs of thrust will be more than enough. I'm assuming that you're planning on buying a transom mount motor and cutting it up. I have no advice for you on how to do that, unfortunately. Minn Kota also makes an engine mount trolling motor with a nice little forward reverse knob. They are unfortunately about double the price of the transom mount models. hoodman wrote: I'm assuming that you're planning on buying a transom mount motor and cutting it up. Yes, exactly. Several people have done it here with the Tubby Tug, and it's pretty well documented on the web as to how to mount, seal, etc. Like I said, I'm not looking for speed, just quiet. A leisurely cruise around the shore, without the hassles of gas power. Vupilot, that's very interesting; something I had not seen before. May I ask where you found those pictures? Those pictures are here in the forum someplace. One of our guys wrapped the wires inside of a rope. It looks great! You may be able to build the rudder as in the plans and mount the trolling motor in the skeg. That would allow the boat to handle as designed. Plans ordered and DELIVERED! I am excited to finally get building. Look forward to watching your progress...please post pics as you go. I'm also looking into the trolling motor for my Amp Eater. My thoughts were to place it where the rudder is to go and that way you can steer and move all in one. Someplace there is a picture of a trolling motor mounted on the bottom of the rudder. He covered the cord with rope. He's been to the Gathering a few times. Nice boat. I think it's a Whitehall. I'm excited to have another amp eater in the works. I'm looking forward to following your progress. Just got back from a long overdue family vacation. 10 days in Scotland. Flights out of Toronto were delayed over 4 hours, so we spent a lot of time sitting in an airport at the start, but it was worth it in the end. Scotland is breathtakingly beautiful. I miss it already. Needless to say, there wasn't any boatbuilding going on for my part. Plans to splash the bare hull will not happen this year, but there's really no hurry. I hope you had a wonderful time. My wife and I hope to get over there in the next couple years. There is plenty of good weather left to get a good start on the Amp Eater. I estimate it took about 80 - 90 hours to construct the hull and fiberglass it. I probably could have spent another 10 hours or so with additional sanding. At that point it is almost 1/2 done. The time you save not putting in a prop shaft you will probably spend fitting the rudder with motor. That arrangement will give you really good maneuverability I imagine. I look forward to following your progress. If you can make it to the gathering in September you can check my Amp Eater out in person.